Project creates Glass-based visual and music cuing system to enhance the quality of life for people with Parkinson’s, expands scope of Dance for PD program. 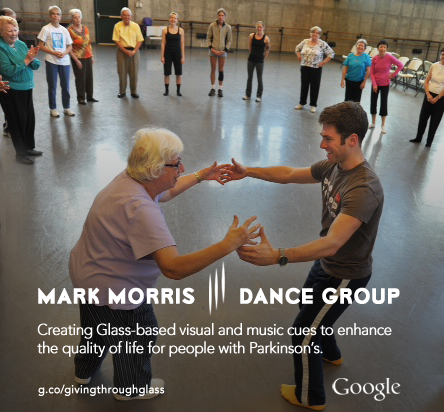 Mark Morris Dance Group (MMDG) is one of the five winners of Google’s Giving through Glass challenge — an open call for U.S. nonprofits to share how they’d use Google Glass to make an impact on their mission and programming. Mark Morris Dance Group’s Moving through Glass app will create an intuitive, portable, dance-based toolkit for people living with Parkinson’s disease. The project will build on the original and internationally acclaimed Dance for PD® program jointly developed by MMDG and Brooklyn Parkinson Group. MMDG joins 3000 Miles to a Cure, Classroom Champions, The Hearing and Speech Agency, and Women’s Audio Mission in receiving the award. MMDG’s Glassware will amplify the company’s 13-year, global initiative to improve the lives of people with Parkinson’s disease by leveraging technology to provide dance-based movement cuing and initiation. The project’s goal is to enable people with Parkinson’s to harness the strategies of professional dancers wherever they are, extending the model of Dance for PD’s live classes and its At Home DVD series. MMDG’s Glassware will feature a menu of visual and musical cuing systems to initiate and support dance moves and fluid, rhythmic walking. All together, these innovative initiatives help people regain a sense of control and independence as they go about their daily lives. The Moving through Glass app will include visual and musical cuing systems that help people initiate a first step and keep a steady, rhythmic walking cadence. The program will also feature a set of short dance exercises that users can practice and enjoy during free moments when traveling or when a TV or computer are not available. Google received over 1,300 applications for the Giving through Glass program, and MMDG’s project was selected as a winner based on four key criteria: impact, innovation, feasibility and implementation. As a winner, MMDG will receive Glass, a $25,000 grant, a trip to Google for training, and access to Glass software developers to make this project a reality.